By 1941 With more than five decades of distinguished service, the historic Empire State Express had become one of the most noteworthy trains in America. To 'celebrate the "Golden Anniversary" of The Empire State Express the New York Central Railroad launched a glittering stainless steel and black streamlined successor. 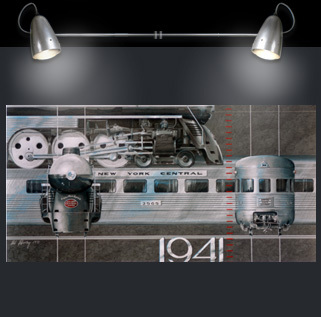 It is ironic that this impressive train, an ultimate benchmark of passenger train travel, was christened on a day some say marked the beginning of the end of the great passenger train era - Dec. 7, 1941, the day the Japanese attacked Pearl Harbor. written consent of the artist.